Oh god, I'm awful! Also, Craftoberfest was awesome! The ladies from Side Launch (right) serving up some beer at Craftoberfest. Was July really my last post? I geez, I am so sorry. 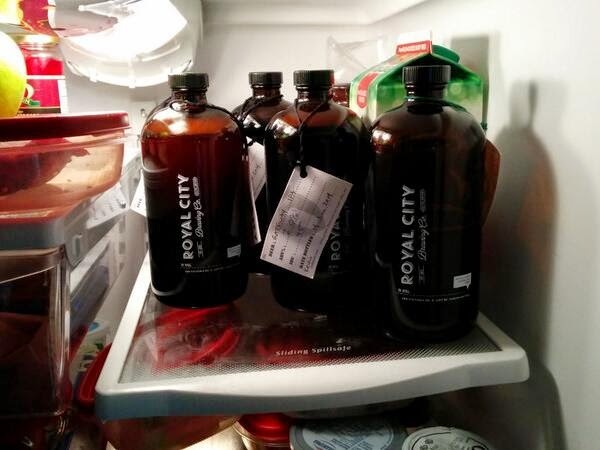 I should correct that - he regularly tries the new offerings from Royal City Brewing in Guelph, but if I wrote about that each time he tried one, this blog would only be about Royal City. Which they might not mind (Jeff generally likes everything he's tried from there). I will write about an event we went to last weekend - the launch of Craftoberfest in Kitchener. Jeff is lucky I'm a pretty awesome wife, because I am rather pregnant, but tagged along with him so he'd have a safe ride home (and he promised to feed me). Not having a beer in my hand also meant I was free to take notes, which I did. We resorted to the ol' lightening bolt system - there is no real range, but on this particular night, three lightening bolts was a pretty OK beer, five was pretty darn good and anything above that was sensational. There was a great group of breweries at Imbibe in Kitchener, and Jeff tried pretty much all of them (save for Steam Whistle, Waterloo Dark and Wellington - he skipped Wellington only because he had the one-off they were featuring at home. It was Put Your Dukes Up, a beer Jeff has had and liked ... hey, I guess that would have been an OK blog post). Great Lakes' Thrust! An IPA - Great Lakes wasn't actually at the event (which was disappointing) but they had sent a beer that was on tap at the bar. 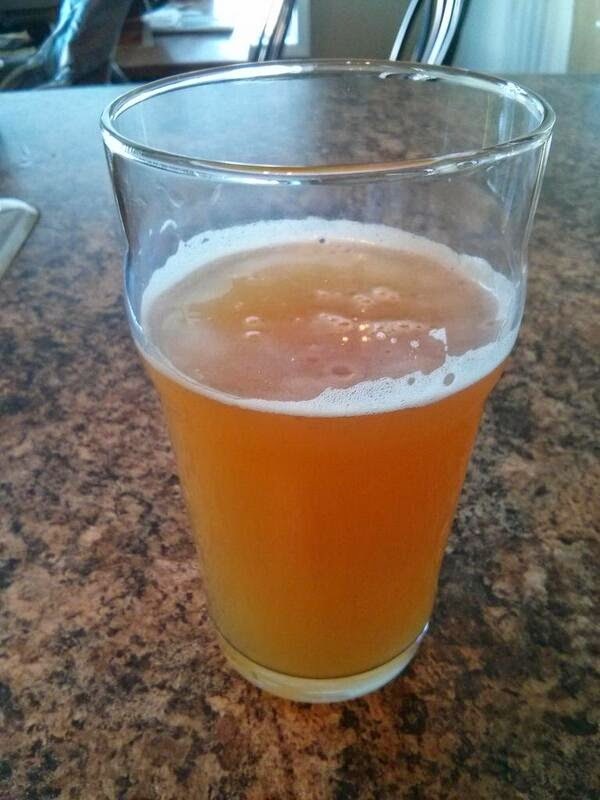 Nickel Brook's Ontario Wet Hop P.A. - which he noted was an improvement over the same beer made last year (the guy handing out the beer also agreed with that). Flying Monkey's Division by Zero - this was an 11% imperial red. The other beer they had was their Antigravity light beer. "You can either pussyfoot or get slapped in the face," Jeff said of the selection. Of the Division by Zero, "It's a freakin' hammer." Admittedly, there were a few he tried that he was not a fan of, but they were few and far between. As well, Saw Dust City had a drink called CLR (coconut lime refresher), which he was OK with and said it tasted like an "island-y drink." "It's pretty refreshing, so it lives up to the name." The event itself was great. We've been itching to hit up Imbibe for a while, but making the drive to Kitchener hasn't been a priority. Now, I would say we'll go back again soon. It's a great place and the staff seemed pretty awesome. The launch spilled into the neighbouring The Museum, which was also pretty cool. There was some live music and a few speeches. But the best part about the event was celebrating craft beer. Because while KW is known for Oktoberfest, the event is sponsored by Molson's. This means craft breweries have been kept out of the halls and events at a festival meant to celebrate beer. Does that make any sense? Not really. Craftoberfest runs this year from Sept. 27 to Oct. 18. There are several events in and around the city and surrounding areas. If you are in the area, I highly recommend checking out an event. Craftoberfest is a great thing. Thank you to everyone who made it happen. I am looking forward to returning to some kind of event next year. Oh yeah - cannot forget the nachos from the Breadbaron. Sooooo good! Inside Royal City Brewery, Guelph. 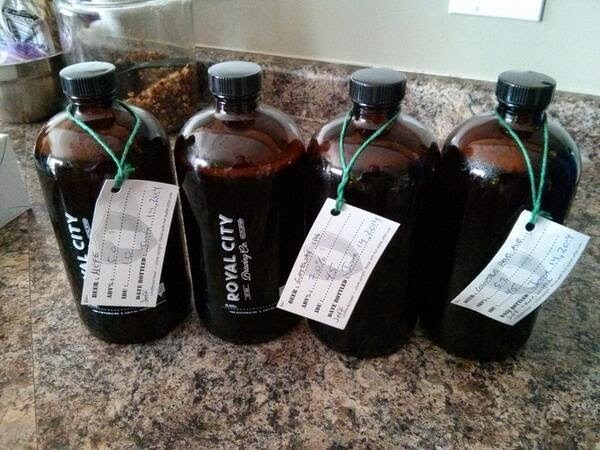 If you are in the Guelph area, you must must MUST stop at the newest brewery - Royal City Brewing. You won't find this beer in the LCBO - it's only sold in growlers of different sizes in the store - but it is well worth the stop. And if you've already been, go again - every week it seems they have something new. I wasn't lying - the milk had to be moved. Jeff has tried pretty much every beer - whether in store or by bringing it home - and I'm not sure there's a beer he hasn't liked. I've only tried the evening stout, but it is by far one of the best stouts I have ever had. I'm not over-exaggerating here, either. It is so good. I cannot wait to have a whole growler of it to myself. I gave a growler to a co-worker to try and he agreed it was mighty tasty. I am eager to try the morning stout - which Jeff says he prefers to the evening stout (although, again, both are good). Some of the fun things they've been trying over there: a lemon thyme beer, banana bread beer and an English sour. There is also a rumour they're working on a one-off for Baker Street Station to go in their new Frosty Feature drinks. Also, watch their Twitter feed - it's got more info than their website (which is still a work in progress). American Wheat - Jeff said it was great on a summer day. Columbus P.A., Evening Stout, Gateway IPA, Gordon Hill Hefe. June 14 - if you don't have plans, maybe you'll want to go to King City for a new craft beer and food truck festival. I'll be honest, those are two of my favourite things. There are nine breweries listed as taking part. The next day is Father's Day, so maybe take dad out a day early for some fun. A couple of weeks ago, Jeff and I got a behind-the-scenes tour of Innocente Brewing in Waterloo. It was a very impressive brewery and owner/head brewer Steve seemed thrilled to fill us in on all of his plans. 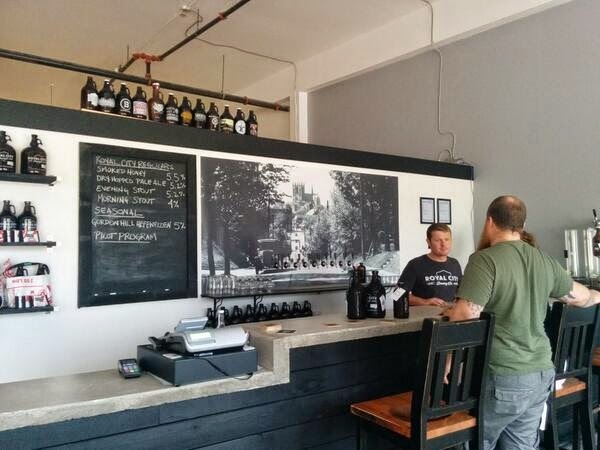 Innocente is now open - Jeff went on Sunday to get a beer. While we've had samples before, these were the first official beers. 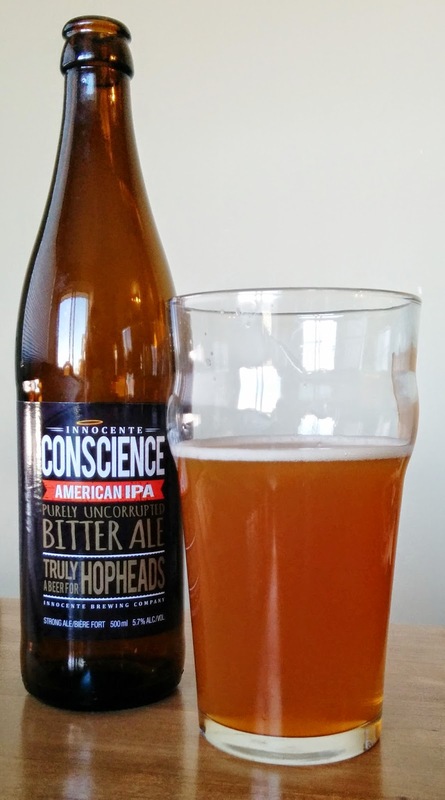 Jeff cracked a Conscience American IPA almost immediately and was a big fan of it. "It was tasty, it was hoppy," Jeff told me tonight on the couch - I should have written down what he said when he had it. He was a pretty big fan. If you're in the area, for sure stop by and say hi to the gang - they're really friendly and seem to love what they're doing. OK, my headline might be slightly overstating the facts, but it's true that some major parts of Downtown Buffalo are being revamped thanks to one brewery operation in particular. Last summer, Jeff and I went on vacation with our daughter to Buffalo and discovered a great brewery that is doing amazing things. The whole operation is now dubbed the Buffalo Brewery District, but I don't remember it being called that when we were there. Instead, we knew we were staying at the Lofts on Pearl (which were apartments that never sold, so they were purchased and turned into hotel rooms), which were also owned by the people who ran the Pearl Street Grill and Brewery next door. While it was a while ago and I really should have written this blog post ages ago, I can tell you Jeff and I spent quite a few meals at Pearl Street. It helped that by staying next door, we got a discount on food at the brew pub, but it was also because we weren't sure what else was around beyond the Subway sandwich shop up the street. The staff were great, the food was tasty and the beer more than quenched our thirst. The back patio was a-mah-zing (to quote Penny from Happy Endings). It was several floors and hanging baskets teemed with petunias. Jeff and I also visited beer mecca, a.k.a. Premier Gourmet, where he was able to pick up a number of different craft beers. I think I could have left him in that store for the entire day - Jeff was a big fan of looking at the beers and selecting just the right ones (he had a limit, of course - he could only drink so much in the time we were there, and he could only bring so much home). Jeff was able to pick up some Flying Bison Brewery beers - although because it was so long ago, I don't exactly remember his take on them (sorry), but I'm pretty sure they were decent. We had plans to visit other breweries, but who knew travelling with a 9-month-old would mean we were stuck in our hotel room a lot while she napped? Yeah ... so our plans changed a little once we got there. But on the last day, before heading back, we did stop at the Buffalo Brew Pub. It was a welcoming spot that might have seemed a little plain, and the food was your typical family restaurant fare, but the service was outstanding and I think the beer was pretty good, too (Jeff only had a little because he was driving). Buffalo might not seem like the typical vacation destination, but it's definitely worth visiting if you're a fan of beer (in fact, when we told friends we were going to Buffalo, a couple asked, "On purpose?" except for Jeff's home brewing friends - they knew exactly why we wanted to go to Buffalo - for the beer). Read more about the Buffalo beer scene. 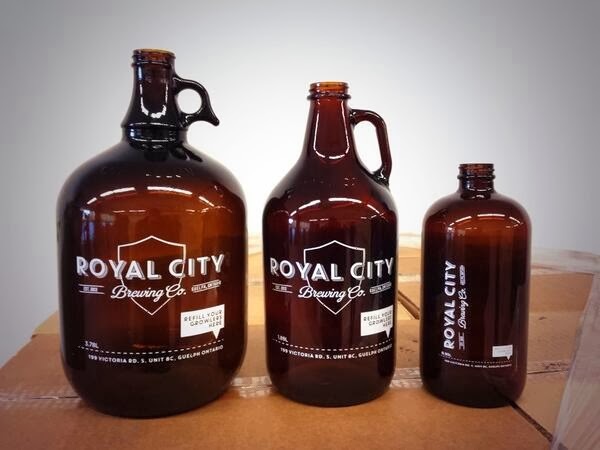 Royal City Brewing Co. is set to open in April (next month! and it will be warmer) and we are super duper excited. Both Jeff and I have been following their progress on Twitter and Facebook. We haven't had a chance to try any beers yet, but the photo they posted today of their cool looking growlers/bottles has us excited for the grand opening! Now I want to try this just to say I've tried it. Bamboo Beer Ltd., claims its beer, made with bamboo, is "beer with benefits." I believe it's out of Hamilton, Ont., but that is not explicitly stated on their website (three of the five restaurants that serve it are in the Hammer, while two are Toronto). What do you guys think? Anyone had it? I stumbled across it when I discovered the Twitter account for the new Hamilton Beer Festival, Aug. 8-9. Bamboo is already listed under the beers section, so I guess if you don't get a chance to try it before summer, you can do it then! My name is Kate and my husband is Jeff. He loves craft beer and regularly has me try whatever he's trying, either at home or at the pub. The blog name is Ontario Beer Widow because we live in Ontario - but it should be noted we'll try craft beers from pretty much anywhere. Read the first blog post to learn more about us.